Nanoloop for iPhone combines sequencer, synthesizer and sampler in one package. It provides all functions for creating electronic music from scratch. This is the same Nanoloop that was developed for Nintendo Game Boy except it has more features. The “send” function now sends .nan files as actual attachments. Files can be handled like any other attachment, they can be saved on a PC and also be opened in the Android version and vice versa. This feature is only available on iOS 3.2 or higher. On older versions, you can still send files URL-encoded. 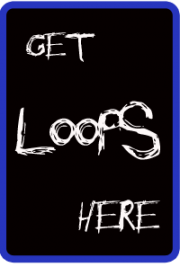 Nanoloop is added to the “open in” dialog. When you open a .nan file in Safari, Mail, Dropbox or any other app that can present an “open in” dialog, nanoloop starts and imports the file. If file sharing apps like Dropbox are installed, there is a “share” function that allows to open .nan files in compatible apps. If compatible apps are installed, an “open in” menu will appear after WAV export, allowing to open the exported file in any app that can open WAV files. Notes with very low volume are not muted anymore. Six example projects are included. Built from ground up and specifically optimised for touchscreens, nanoloop’s stepsequencer is very fast and simple to use. Each synth channel is three-voice polyphonic. Short samples can not just be used in a drum-machine style, but also be pitched and played as notes. Samples can be recorded via microphone and from nanoloop’s own sound output. When iOS3.2 or higher is running on the device, you can up- and download samples (and also project files) in iTunes. Alternatively, samples can be imported via e-mail. An online conversion tool is available at www.nanoloop.com. You can copy & paste samples to / from apps that support copy & paste of audio. With nanoloop for iPhone, you can send your saved projects to other nanoloop users and your own PC via e-mail. If nanoloop is installed on the recipient’s iPhone / iPod, she/he can simply tap on the file name in the received e-mail to start nanoloop and import the attached file so that it is available for editing. This makes collaboration very easy, multiple users around the world can work on the same project by simply e-mailing the file back and forth. Songs can be exported to a WAV file that is accessible via iTunes (simply drag & drop files in finder). The exported file is also copied to the clipboard so that it can be pasted in other apps that support pasting audio. Alternatively, projects sent by e-mail can be converted to WAV audio files with just one click, using the nanoloop2wav desktop conversion tool (Mac OS X only).